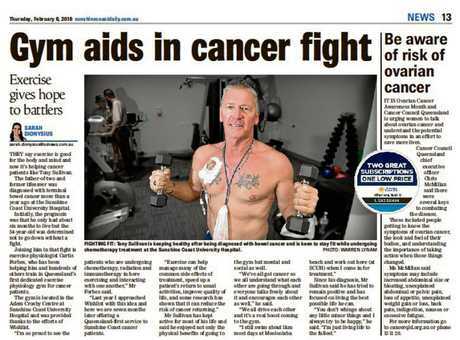 HIS shirtless frame revealed his trim upper body and love of tattoos as he pumped weights with his chemotherapy tubes attached. 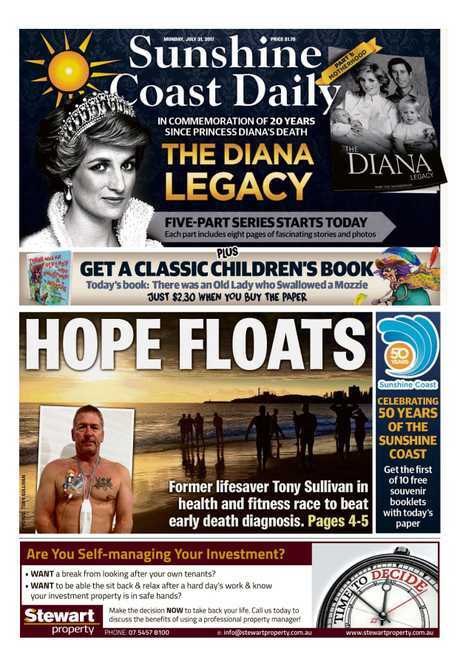 The smiling face jumping out from the page of the Daily on February 8 belonged to Tony Sullivan, promoting Wishlist's fundraising efforts that had helped create the new Adem Crosby Centre's physiology gym at Sunshine Coast University Hospital. 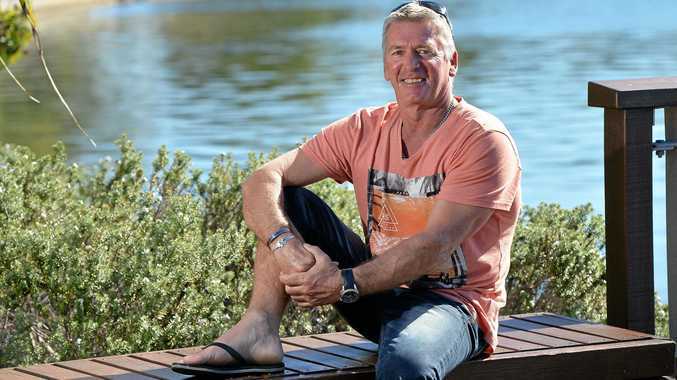 The father-of-two, grandfather, former Kawana Waters lifesaver and IRB World Champion told journalist Sarah Dionysius at the time that he was determined not to go down without a fight after being diagnosed with stage 4 terminal bowel cancer. At 54, he had already beaten a six-month death sentence given after his initial diagnosis in January last year. 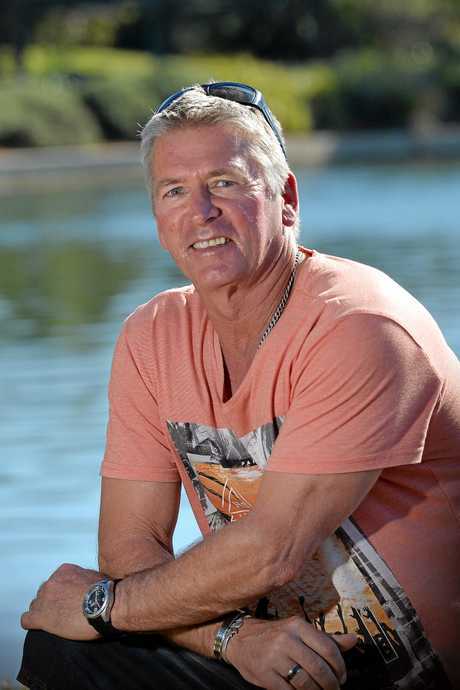 The former Wurtulla man said in the interview he was striving to remain positive that he could still beat the scourge that had attacked his body and he was focused on living the best possible life he could. "You don't whinge about any little, minor things and I always try to be happy," he said. "I'm just living life to the fullest." And that's the one lesson we can all take away from his passing late Tuesday night, September 4. I saw first-hand how Tony lived every minute of his last 18 months, seemingly fitting an extra lifetime into the little time he had left. The Mt Mellum resident had always said "yes" to life but here was a man possessed. Tony bought a massive 4WD, a boat and camper trailer and started ticking off the remaining items on his bucket list. Trek to the Birdsville races on his own, staying overnight in little country towns along the way. Tick. Fishing trip to Cape York. Tick. Gem fossicking at Lightning Ridge. Tick. Cruise to the Melbourne Cup. Tick. Spending time with grandkids and teaching them to swim. Tick. Holidays to visit friends and family from Cairns to New Zealand were scheduled around fortnightly chemotherapy treatments that made him so sick. 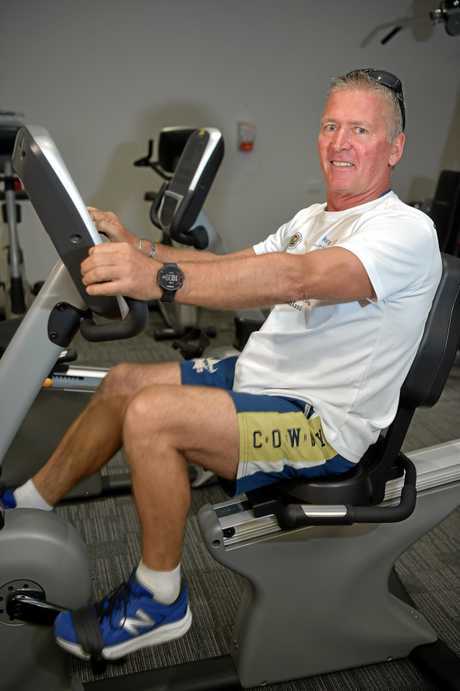 Tony exercised daily, swimming 2km across the bay - even on wintery mornings - with the Mooloolaba Beach Bums, climbing Mt Coolum and walking the Coast. He joined a Caloundra camping group where he met his partner Del, traversing the countryside on getaways and hiking Mt Warning near Murwillumbah together. In what were to be his final months, Tony was contemplating joining a team of doctors and medical officers on their Kokoda Trail expedition, and a ski trip to New Zealand with one of his two daughters. Such super-human efforts, though, belied his down-to-earth nature. The hard-working roof tiler was a punter easily swayed by horse names, a passionate rugby league fan, keen boatie and fisherman, enthusiastic grandfather, loving partner, devoted dad and charitable soul. He brought fun and laughter into hundreds of lives as a genuinely friendly guy, a loyal mate, good neighbour, golf buddy, dependable surf patrol captain, and global adventure-seeker who called the Sunshine Coast paradise but held a special place in his heart for the Far North Queensland of his teenage years. 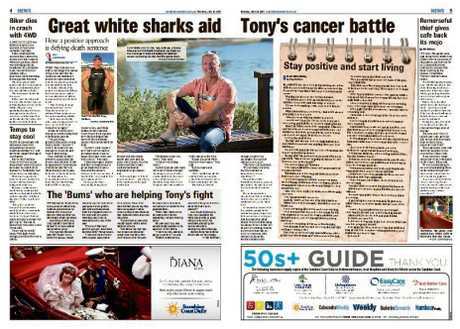 With his boss Rene Van Beek, surf lifesaving mate Peter Kiraly and former neighbour Ian Lowrie, Tony was president of the Living the Dream Foundation social golf club, with the foursome playing each Friday at Beerwah, which flew the flag at half-mast on Friday, September 7. Earlier this year, he surprised even himself by ending the day one shot off the winner of the club's Wednesday competition. As late as two weeks ago, Tony rode in the golf buggy - with crutches in tow after the cancer had affected his right leg - and joked along with the others as always before heading back to hospital. On Saturday, after Del planted the seed of the idea with his doctors, he called one of those mates to ask a favour. Could he watch his beloved North Queensland Cowboys for the last time at our place? He refused the full pain-management injections to be able to leave the hospital for just over two precious hours. 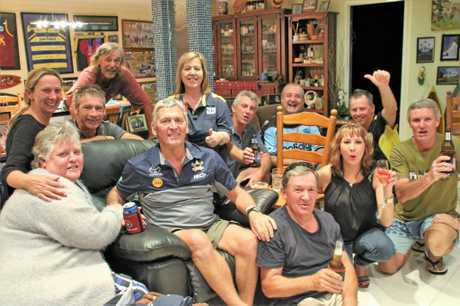 With the live match being called on the big screen and only half-a-kilometre away from his Birtinya ward, he watched Johnathan Thurston's final game and shared the sweet victory with more than a dozen close family and friends who were all Cowboys fans for a day. Tony's passing has left us all in disbelief that we will never again hear his spot-on attempt at an Irish accent, telling yet another Paddy and Mick joke. 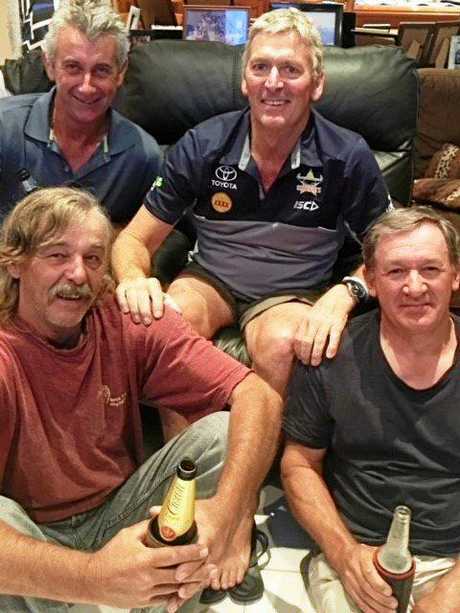 We'll never again hear him argue with the referees at a State of Origin party, or head out at dawn on the water in his boat, or chat with him at the deck while checking the surf, or laugh with him over a beer on Thursday Steak Night at Club Kawana. We'll never again read another rambling, hysterically funny email about his travels in far-flung corners. We'll never again enjoy a live music gig together, or solve the world's problems at a neighbourhood driveway party, or gather around the barbie and dartboard with his tribe of mates, young and old. Losing a close friend or loved one makes you do your fair share of navel-gazing. We could all be better people if we were more like Tony Sullivan. An ordinary bloke did his bit to leave an indelible mark on the world. Tony Sullivan's funeral will be held at 3pm on Monday, September 10, at Gregson and Weight, Caloundra.